Informatics Ph.D. student Katherine Lo has received a Graduate Research Fellowship from the National Science Foundation (NSF GRFP). The highly selective fellowship program awards fellows a three-year annual stipend of $34,000, a $12,000 cost of education allowance, and opportunities for international research and professional development. At iConference 2016, which took place March 20-23 in Philadelphia, the Informatics team of Kathleen H. Pine, assistant project scientist; Melissa Mazmanian, associate professor; and graduate student Chris Wolf received the prestigious Lee Dirks Award for Best Paper. Their paper, “The Work of Reuse: Birth Certificate Data and Healthcare Accountability Measurements,” assesses the key information science concept of data reuse in the practice of recording birth certificate data. It documents an ethnographic study of ways to “assess and improve birth certificate data in response to a new re-use of birth certificate data for measurements introduced to hold hospitals accountable for the quality of the care they are delivering,” according to the paper’s abstract. Informatics Lecturer Dan Frost is helping to write the framework for the next generation of K-12 computer science (CS) education, thanks to funding from Code.org and the Association for Computing Machinery (ACM). Informatics Professor Crista Lopes will provide the Keynote speech at the Immersive Learning Research Network Conference 2016 (ILRN 2016), where immersive learning experts and practitioners from around the world gather to “develop the scientific, technical and applied potential of immersive learning,” according to the conference website. This is the second time the conference will meet, this year at the University of California, Santa Barbara from June 27 to July 1. The Tides Foundation honored Lopes for her work in developing OpenSimulator, making her the first woman to receive the prize. 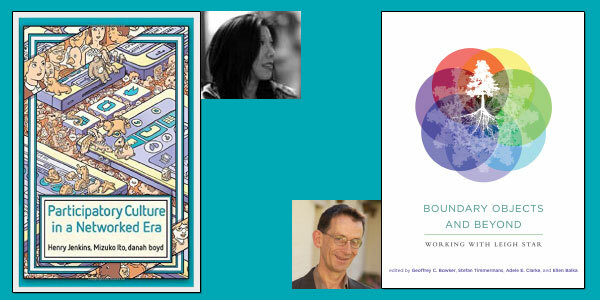 Both research scientist Mimi Ito and Informatics professor Geoffrey Bowker have recently released books that delve deeply into the sociocultural aspects of today’s technical age. Informatics Professor Paul Dourish was featured as a guest on a March 2016 episode of Up Close, the research talk show from the University of Melbourne, Australia. The topic of his interview—“The social life of algorithms: Shaping, and being shaped by, our world”—explains how algorithms, as more than mere technical objects, guide our social lives and organization, and are themselves evolving products of human social actions. The interview was conducted by Andi Horvath and is now available on iTunes, Stitcher and TuneIn. You can also find the full interview and its transcription on the Up Close website or listen to the stream below. An Informatics team, including Assistant Project Scientist Kathleen H. Pine, Associate Professor Melissa Mazmanian and graduate student Chris Wolf, has been nominated for the iSchools Lee Dirks Award for Best Paper. Their paper, “The Work of Reuse: Birth Certificate Data and Healthcare Accountability Measurements,” assesses the key information science concept of data reuse in the practice of recording birth certificate data. It documents an ethnographic study of ways to “assess and improve birth certificate data in response to a new re-use of birth certificate data for measurements introduced to hold hospitals accountable for the quality of the care they are delivering,” according to the paper abstract. The Center for Technology, Society and Policy (CTSP) at UC Berkeley has named informatics Ph.D. student Katherine Lo and former ICS postdoctoral researcher Morgan Ames fellows, resulting in a CTSP collaborative project. Lo and Ames’ project, “Promoting Ethical Technical Cultures and Digital Citizenship for Low-Income and Minority Students in Richmond, California,” centers on creating ethical technical cultures.